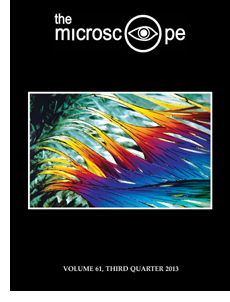 Excerpt: Nearly every year for 65 years, microscopists from around the world have been gathering to share their passion and experiences with the minute realm revealed primarily through one instrument — the light microscope. Walter C. McCrone originally conceived this meeting, now known as Inter/Micro (short for international microscopy), shortly after he left the academic world of Cornell University in 1944 as a post doc in chemical microscopy and arrived in Chicago for his first professional job as a chemical microscopist for Armour Research Foundation (now known as IIT Research Institute). Excerpt: McCrone Research Institute held the 65th annual Inter/Micro microscopy conference on July 15-19 in its lecture rooms and laboratories in Chicago, drawing more than 100 attendees from around the world. Excerpt: Autumn in North America is one of the most fabulous spectacles in nature. This year’s cavalcade of spectacular gold and russet, red and yellow, has created unforgettable memories. From the first tints of fall appearing in Vermont and New Hampshire in the middle of September to the glories of Massachusetts, Rhode Island and Maine — vivid colors that are only now starting to fade — the forests have been transformed into a riot of exquisite autumnal shades. It is all so vivid, so romantic. Yet my work revealed another way of looking at it that radically changes our perspective, while a tale published in a children’s storybook was to teach me a lesson. Will Raman Save the Polarized Light Microscope? Abstract: Chemical microscopy is a field with few practitioners, which is surprising for those of us who do practice it. Everyday we witness the tremendous power of the polarized light microscope (PLM) to solve analytical problems. In my opinion, some of the most powerful applications of the PLM exploit its ability to visually discriminate different sample components, including the differentiations of various hydration states, polymorphs and particles of identical composition that were processed differently. This enables microscopists to visually “separate” components that are challenging to separate using traditional wet chemical methods. However, manual isolation of these particles is often required in order to obtain instrumental data for identification purposes. This can be a daunting task to those who are inexperienced. The necessity of physically isolating extremely small particles from complex mixtures may limit the application of the PLM. Raman microspectroscopy, on the other hand, makes the physical separation and isolation unnecessary. Particles can be analyzed directly through a coverslip without additional sample preparation. This means that the visual discrimination ability of the PLM can be coupled with a powerful spectroscopy technique, on a microscopic scale, without the need to use a tungsten needle, the tool commonly used for small particle manipulation. For this reason, I believe that Raman microspectroscopy has the potential to revive the use of the PLM and further develop the field of chemical microscopy. Excerpt: Stephen A. Shaffer passed away on July 23, 2013. He was 60 years old. Steve turned his interest in microscopy to a degree in criminalistics from the University of California at Berkeley, and then employment by the Fresno County Sheriff’s Department and the Institute of Forensic Science in Oakland. He was a founding partner in Forensic Analytical Laboratories, Inc., which still employs microscopy to solve environmental, industrial hygiene and forensic science problems.